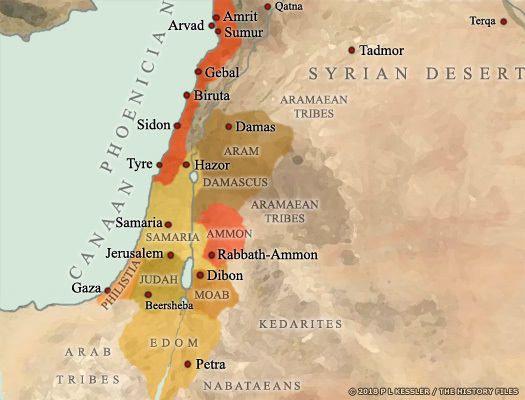 Founded by Amorite settlers at the start of the second millennium BC, Arvad was also populated by Canaanites, and later became a Phoenician kingdom. Known as Arado or Arados to the Greeks, and by many variations thereafter, the fishing town of Arvad fills the only island belonging to modern Syria. It is located three kilometres from Tartus and is approximately 700 metres (800 yards) long. Limited resources meant it was always dependent on the mainland for its survival, but the island was also important as a base for commercial ventures into the Orontes valley. For much of the time, the small city of Amrit fell under Arvad's control, as apparently did a number of regional cities in northern Canaan. Egypt maintains a trading presence in the region, while Amorites settle and found the city of Arvad. Settlers from Arvad found the city of Amrit, which remains under Arvad's authority. Thotmes of Egypt takes Arvad in his campaign in northern Syria. The Egyptians conquer the Levant and Syria and establish three provinces in their conquered territories which are named Amurru (in southern Syria), Upe (in the northern Levant), and Canaan (in the southern Levant). Each one is governed by an Egyptian official. Native dynasts are allowed to continue their rule over the small states, but have to provide annual tribute. There is general collapse in the region as instability grips the Mediterranean coast and the Hittite empire is destroyed by the Sea Peoples and other various groups. Unlike Byblos, Sidon, and Tyre, Arvad is sacked, but the city manages to drive back the invaders and stage a recovery. Descended from the Canaanites who formerly inhabited the entire Levant region, most of these later Canaanites occupied the long coastal strip which forms modern Lebanon. Possibly just a typical Phoenician kingdom, Arvad is thought by some scholars to be the world's first republic, in which its citizens formed the government. Whether they did or not, there are extremely few kings known for this period, and the names of the few that are known only survive through their interaction with the Assyrians. A weakened Egypt loses its remaining imperial possessions in Canaan. Ashurnasirpal II of Assyria makes Arvad tributary during his conquest of Syria, but the city soon rebels. Matinu-ba'al is a member of an alliance of states which also includes Ammon, Byblos, Damas, Edom, Egypt, Hamath, Kedar, and Samaria. Together they fight Shalmaneser III of Assyria at the Battle of Qarqar which consists of the largest known number of combatants in a single battle to date, and is the first historical mention of the Arabs from the southern deserts. Despite claims to the contrary, the Assyrians are defeated, since they do not press on to their nearest target, Hamath, and do not resume their attacks on Hamath and Damas for about six years. Became a vassal of Assyria. Assyria conquers all of Phoenicia. Abd-ilihit is forced to pay tribute to his new masters. Yakinlu is compelled by Ashurbanipal of Assyria to submit and send one of his daughters to become a member of the royal harem, along with a large amount of tribute in the form of a dowry. Babylonia conquers all of Phoenicia, including Arvad. Arvad and all of Phoenicia is submerged within the Persian empire. Arvad is one of four 'kingdoms' created by the Persians in Phoenicia, and is ruled by governors in the name of the king. Strato is only too ready to ally himself to Alexander the Great in his conquest of Syria and Phoenicia, even supplying ships to aid in the conquering of Tyre. All of Phoenicia is conquered by the Greek empire. Arvad is renamed Antiochia in Pieria by Antiochus I Soter of the subsequent Seleucid empire.